The round was rather attractive and full of interesting results. The round ended with defeat of the leader, favorites losing the games and games ending by tiny margin. Here is the last round review presented by ESL. Top ranked Mobis Phoebus (26-8) recorded its eighth loss in Seoul on Saturday night. Visitors were edged by tenth ranked Samsung Thunders (9-25) 88-86. American forward Eugene Phelps (198-90, college: Long Beach St.) fired a double-double by scoring 25 points and 15 rebounds for the winners. The former international forward Tae-Young Moon (197-78, college: Richmond) chipped in 19 points. The former international forward Ricardo Ratliffe (203-89, college: Missouri) produced a double-double by scoring 24 points, 15 rebounds and 5 assists for lost side. Samsung Thunders maintains tenth place with 9-25 record. Mobis Phoebus at the other side still keep top position with eight games lost. Samsung Thunders are looking forward to face higher ranked KT Sonicboom (#3) in Busan in the next round and it will be quite challenging to get another victory. Mobis Phoebus will play on the road against Anyang KGC and are hoping to win this game. Fourth-ranked Anyang KGC (17-17) made lots of trouble for second ranked ET Land Elephants (22-12). The visitors from Inchon managed to secure only two-point victory 61-59. However their fans expected easier game. Worth to mention a great performance of the former international guard Chan-Hee Park (190-87) who helped to win the game recording 12 points and 6 assists. Charles Rhodes contributed with 8 points and 12 rebounds for the winners. Canadian guard Justin Edwards (190-92, college: Kansas St.) answered with 13 points, 7 rebounds and 5 assists for Anyang KGC. Both coaches used bench players in such tough game. ET Land Elephants have a solid series of three victories in a row. They maintain second place with 22-12 record having four points less than leader Mobis Phoebus. Anyang KGC at the other side keeps the fourth position with 17 games lost. ET Land Elephants will play against DB Promy (#5) in Wonju in the next round. Anyang KGC will play at home against the league's leader Mobis Phoebus and hopes to get back on the winning track. A very close game took place in Jeonju between Goyang Orions and KCC Egis. Eighth ranked Goyang Orions (16-18) got a very close victory on the road over 5th ranked KCC Egis (16-18). Goyang Orions managed to escape with a 1-point win 87-86 in the fight for the sixth place. Do-Soo Kim stepped up and scored 18 points, 6 rebounds and 4 assists for the winners. At the losing side Seung-Jin Ha responded with a double-double by scoring 15 points and 11 rebounds. Both coaches tested many bench players in such tough game. Goyang Orions have a solid series of four victories in a row. They moved-up to sixth place, which they share with KCC Egis and LG Sakers. KCC Egis lost third consecutive game. Goyang Orions will meet at home LG Sakers (#6) in the next round. KCC Egis will have a break next round. A very interesting game took place in Jeonju. It ended with only three-point home defeat of 5th ranked KCC Egis (16-18) to third ranked KT Sonicboom (20-13) 106-103 on Sunday evening. Marcus Landry nailed a double-double by scoring 27 points and 11 rebounds for the winning side. Both coaches allowed to play bench players in such tough game. KT Sonicboom maintains third place with 20-13 record having seven points less than leader Mobis Phoebus. KCC Egis lost third consecutive game. They dropped to the sixth position with 18 games lost. KT Sonicboom's next round opponent will be bottom-ranked Samsung Thunders (#10) in Seoul and are hoping to win another game. An exciting game between Top Four teams was played in Busan. Third ranked KT Sonicboom faced 4th placed Anyang KGC. Host KT Sonicboom (20-13) defeated guests from Anyang (17-17) 85-76. Marcus Landry fired 25 points, 9 rebounds and 4 assists for the winners. Anyang KGC's coach rotated eleven players in this game, but that didn't help. KT Sonicboom maintains third place with 20-13 record having seven points less than leader Mobis Phoebus. Loser Anyang KGC keeps the fourth position with 17 games lost. KT Sonicboom will face bottom-ranked Samsung Thunders (#10) in Seoul in the next round and are hoping to win another game. Anyang KGC will play at home against the league's leader Mobis Phoebus (#1) and hope to win that game. LG Sakers were defeated by ET Land in Inchon 85-79. DB Promy beat SK Knights at home 86-79. LG Sakers destroyed Samsung Th. on the opponent's court 91-69. The best stats of 25th round was 38 points (!!! ), 8 rebounds and 5 assists by Brandon Brown of KCC Egis. A very close game took place in Jeonju between Goyang Orions and KCC Egis. Eighth ranked Goyang Orions (16-18) got a very close victory on the road over 5th ranked KCC Egis (16-18). Goyang Orions managed to escape with a 1-point win 87-86 in the fight for the sixth place. Forward Do-Soo Kim (193-81) stepped up and scored 18 points, 6 rebounds and 4 assists for the winners and American power forward Darryl Monroe (201-86, college: George Mason) chipped in 15 points and 6 rebounds. At the losing side the former international center Seung-Jin Ha (221-85) responded with a double-double by scoring 15 points and 11 rebounds and American Brandon Brown (201-85, college: CS San Bernar.) scored 15 points and 7 rebounds. Five Goyang Orions and four KCC Egis players scored in double figures. Both coaches tested many bench players in such tough game. Goyang Orions have a solid series of four victories in a row. They moved-up to sixth place, which they share with KCC Egis and LG Sakers. KCC Egis lost third consecutive game. Goyang Orions will meet at home LG Sakers (#6) in the next round. KCC Egis will have a break next round. An exciting game between Top Four teams was played in Busan. Third ranked KT Sonicboom faced 4th placed Anyang KGC. 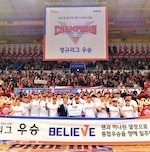 Host KT Sonicboom (20-13) defeated guests from Anyang (17-17) 85-76. KT Sonicboom looked well-organized offensively handing out 23 assists. 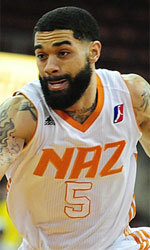 American forward Marcus Landry (201-85, college: Wisconsin) fired 25 points, 9 rebounds and 4 assists for the winners. The former international forward Young-Hwan Kim (195-84) chipped in 13 points, 5 rebounds and 7 assists (perfect from the field making all six shots). Four KT Sonicboom players scored in double figures. American forward Reyshawn Terry (203-84, college: N.Carolina) produced a double-double by scoring 27 points and 15 rebounds and forward Hyun-Min Choi (196-90) added 11 points and 7 rebounds respectively for lost side. Anyang KGC's coach rotated eleven players in this game, but that didn't help. KT Sonicboom maintains third place with 20-13 record having seven points less than leader Mobis Phoebus. Loser Anyang KGC keeps the fourth position with 17 games lost. KT Sonicboom will face bottom-ranked Samsung Thunders (#10) in Seoul in the next round and are hoping to win another game. Anyang KGC will play at home against the league's leader Mobis Phoebus (#1) and hope to win that game. There was no surprise in Inchon where 8th ranked LG Sakers (16-18) were defeated by second ranked ET Land Elephants (22-12) 85-79 on Saturday. However just six-point win is not that big difference and the fans of host team counted on more convincing victory. LG Sakers were plagued by 26 personal fouls down the stretch. American guard Giddy Potts (188-95, college: Middle Tenn.St.) fired 24 points for the winners. International forward Sang-Jae Kang (202-94) chipped in 15 points and 6 rebounds. Central African-American power forward James Mays (205-86, college: Clemson) produced 20 points and 7 rebounds and the former international forward Sung-Min Cho (197-83) added 22 points and 6 steals respectively for lost side. Four LG Sakers players scored in double figures. LG Sakers' coach Young-Min Kim let to play ten players, but that didn't help to avoid defeat in this game. ET Land Elephants have a solid series of three victories in a row. They maintain second place with 22-12 record having four points less than leader Mobis Phoebus. Loser LG Sakers dropped to the sixth position with 18 games lost. ET Land Elephants will face DB Promy (#5) in Wonju in the next round. LG Sakers will play on the road against Goyang Orions in Daegu and it may be a tough game between close rivals. Top ranked Mobis Phoebus (26-8) recorded its eighth loss in Seoul on Saturday night. Visitors were edged by tenth ranked Samsung Thunders (9-25) 88-86. American forward Eugene Phelps (198-90, college: Long Beach St.) fired a double-double by scoring 25 points and 15 rebounds for the winners. The former international forward Tae-Young Moon (197-78, college: Richmond) chipped in 19 points. Four Samsung Thunders players scored in double figures. The former international forward Ricardo Ratliffe (203-89, college: Missouri) produced a double-double by scoring 24 points, 15 rebounds and 5 assists and the former international power forward Ji-Hoon Ham (198-84) added 20 points, 7 rebounds and 5 assists respectively for lost side. Samsung Thunders maintains tenth place with 9-25 record. Mobis Phoebus at the other side still keep top position with eight games lost. Samsung Thunders are looking forward to face higher ranked KT Sonicboom (#3) in Busan in the next round and it will be quite challenging to get another victory. Mobis Phoebus will play on the road against Anyang KGC and are hoping to win this game. No shocking result in a game in Wonju where seventh ranked DB Promy (16-17) defeated 9th ranked SK Knights (11-23) 86-79 on Saturday. They outrebounded SK Knights 43-32 including 32 on the defensive glass. DB Promy looked well-organized offensively handing out 24 assists. American guard Marcus Foster (190-95, college: Creighton, agency: Pensack Sports) fired a double-double by scoring 19 points, 11 rebounds and 7 assists for the winners. His fellow American import power forward Leon Williams (203-86, college: Ohio) chipped in 14 points and 9 rebounds. International guard Sunhyung Kim (187-88) produced 19 points and 5 assists and international forward Youngjun An (195-95) added 17 points and 5 rebounds respectively for lost side. Both teams had four players each who scored in double figures. Both coaches allowed to play bench players saving starting five for next games. DB Promy moved-up to fifth place. SK Knights lost third consecutive game. Defending champion keep the ninth position with 23 games lost. DB Promy will face league's second-placed ET Land Elephants in Inchon in the next round and it will be quite challenging to get another victory. Fourth-ranked Anyang KGC (17-17) made lots of trouble for second ranked ET Land Elephants (22-12). The visitors from Inchon managed to secure only two-point victory 61-59. However their fans expected easier game. Worth to mention a great performance of the former international guard Chan-Hee Park (190-87) who helped to win the game recording 12 points and 6 assists. American power forward Charles Rhodes (203-85, college: Mississippi St.) contributed with 8 points and 12 rebounds for the winners. Canadian guard Justin Edwards (190-92, college: Kansas St.) answered with 13 points, 7 rebounds and 5 assists and the former international forward Hee-Jong Yang (194-84) added 13 points and 8 rebounds in the effort for Anyang KGC. Both coaches used bench players in such tough game. ET Land Elephants have a solid series of three victories in a row. They maintain second place with 22-12 record having four points less than leader Mobis Phoebus. Anyang KGC at the other side keeps the fourth position with 17 games lost. ET Land Elephants will play against DB Promy (#5) in Wonju in the next round. Anyang KGC will play at home against the league's leader Mobis Phoebus and hopes to get back on the winning track. Rather expected game in Seoul where 10th ranked Samsung Thunders (9-25) were rolled over by eighth ranked LG Sakers (16-18) 91-69 on Sunday. LG Sakers dominated down low during the game scoring 54 of its points in the paint compared to Samsung Thunders' 32. They outrebounded Samsung Thunders 51-28 including a 34-16 advantage in defensive rebounds. American point guard Joshia Gray (185-93, college: LSU) fired 20 points, 7 rebounds and 5 assists for the winners. Central African-American power forward James Mays (205-86, college: Clemson) chipped in a double-double by scoring 18 points and 12 rebounds. Four LG Sakers players scored in double figures. American forward Eugene Phelps (198-90, college: Long Beach St.) produced 15 points and 7 rebounds and guard Gwan-Hee Lee (190-88) added 14 points respectively for lost side. The winner was already known earlier in the game, so both coaches allowed to play the bench players saving starting five for next games. LG Sakers moved-up to sixth place, which they share with Goyang Orions and KCC Egis. Loser Samsung Thunders stay dead last with 25 lost games. LG Sakers will face Goyang Orions (#8) in Daegu in the next round. Samsung Thunders will play on the road against KT Sonicboom in Busan and hope to win that game. A very interesting game took place in Jeonju. It ended with only three-point home defeat of 5th ranked KCC Egis (16-18) to third ranked KT Sonicboom (20-13) 106-103 on Sunday evening. KT Sonicboom made 18-of-22 charity shots (81.8 percent) during the game. American forward Marcus Landry (201-85, college: Wisconsin) nailed a double-double by scoring 27 points and 11 rebounds for the winning side and the former international forward Hongseok Yang (199-97) accounted for 23 points and 5 rebounds (on 8-of-10 shooting from the field). American Brandon Brown (201-85, college: CS San Bernar.) came up with 38 points (!!! ), 8 rebounds and 5 assists and the former international forward Jung-Hyun Lee (191-87) added 20 points and 9 assists respectively for KCC Egis in the defeat. Both teams had four players each who scored in double figures. Both coaches allowed to play bench players in such tough game. KT Sonicboom maintains third place with 20-13 record having seven points less than leader Mobis Phoebus. KCC Egis lost third consecutive game. They dropped to the sixth position with 18 games lost. KT Sonicboom's next round opponent will be bottom-ranked Samsung Thunders (#10) in Seoul and are hoping to win another game.